Eighty-eight-year-old Maud is not your typical grandmother type. She does not bake cookies, embrace people warmly, or welcome new residents to her apartment building with lovely meals. Maud kills people. Granted, Maud does not kill random strangers. She does not go after people who make society a worse place. She does not murder people for money. She simply likes her life how it is, and will get rid of anyone who threatens it. It is these “problems” that drive Maud to murder. She does have a lot to protect—her apartment, her belongings, her peaceful existence, even her memories. Maud has no patience for anyone, young or old, male or female, who cannot see how they are becoming a nuisance. Helene Tursten brings Maud to life in this dark and disturbing, but also charming, set of stories. Why do we care about this murderess and her need to eliminate those people who cross her? Perhaps we see some kind of satisfaction in her ability to take care of herself in a way that an actual person never could. People do bother each other in real life, in myriad ways, but they don’t go around murdering each other a la Maud. If they did, our world would be quite a different place. Tursten’s writing is witty and sharp, humorous and edgy. The stories read quickly and easily, with interesting Swedish names and words spotted throughout. The atmosphere is simple and well-drawn, giving a complete and detailed image of the setting and Maud’s way of thinking. 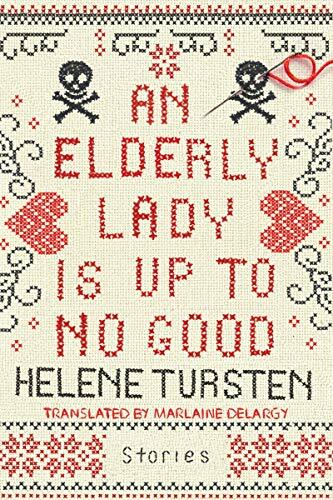 An Elderly Lady Is Up to No Good is entertaining, fun, and ultimately satisfying. It’s a great little book to keep in your bag for those moments when you find yourself waiting in a doctor’s office or restaurant . . . or perhaps simply curled up on your sofa with a cup of tea. Let’s just hope Maud hasn’t poisoned it.